ACTUALLY, this experiment comes straight from the steel-capped toe of a swift dumping – you know, the kind that leaves you thinking you can’t do anything anymore, whereas you used to be able to tie your shoes and go to work quite capably. Hence, I must do everything. I’d speed-read a tome on the train called Meditation in a Hurry, or Hurry Up and Meditate, or Oh Come On, How Hard Can it Be, or something, and I’m going for an elementary exercise that focuses on breathing. Something deep inside’s been stopping me from attempting meditation till now, as though it would be betraying some fag-stained fibre of my former self that I should be true to for some reason. 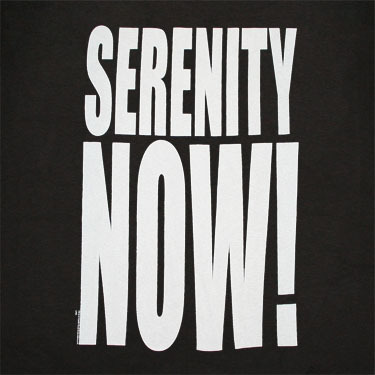 As a family, my clan scoff heartily at serenity and seeking spiritual planes, which will come as a surprise to no one who’s ever come round for a barbecue and left four times over the limit and strangely despondent. Anyway, the breathing’s all right – I hardly get distracted at all, although I’m only starting with the recommended ten minutes. I’m disappointed I don’t reach the dizzy heights Elizabeth Gilbert does in Eat Pray Love, where she’s warbling around in a netherwordly vortex like she’s in some late-night rage video, but to be fair she did put in the hard work. Even so, I feel like I’ve tapped into the godly feeling I revered when I went through my religious phase as a kid… which morphed into an attributing-godlike-qualities-to-unsuitable men phase… which morphed into a desire for the comforting arms of alcohol and pharmaceuticals. I’d better keep close tabs on this one.